Doctor Who: Big Finish - SWORD OF ORION Review | Warped Factor - Words in the Key of Geek. Nathan Browne looks back at an early Eighth Doctor adventure from Big Finish. 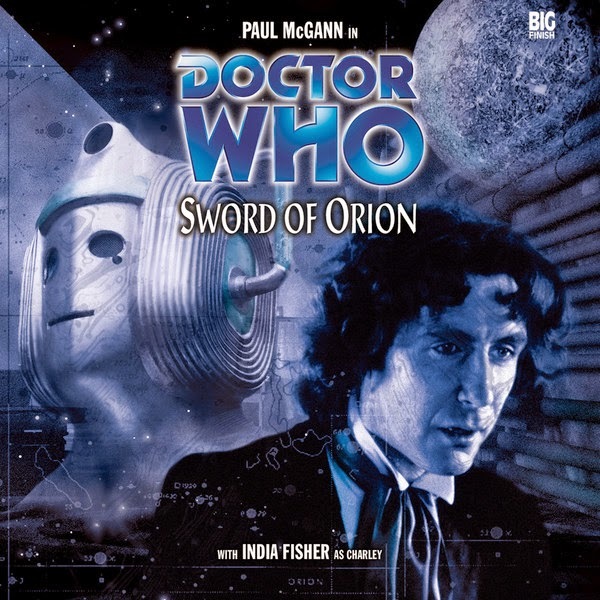 Released in 2001, Sword of Orion was only the second ever Eighth Doctor story from Big Finish, but it is one that has truly stood the test of time and remains an essential purchase for any Whovian. Written by Nicholas Briggs, and adapted from his original Audio Visuals fan produced adventure of the same name, Sword of Orion was my entry into the world of Big Finish audio, not through a monthly CD purchase but via a transmission on BBC Radio in 2005. Briggs stated that he set out to write the most traditional, straight-down-the-line Cyberman story he could, and he certainly succeeded admirably. Deep in a region of space known as the Garazone System, the Doctor (Paul McGann) and Charley (India Fisher) get themselves involved with a gang of scavengers raiding an abandoned space vessel for loot. In traditional Doctor Who style they soon realise that there’s more lurking in the shadows than rusting computers and broken instruments. Sword of Orion won't win any awards for originality whatsoever, and when a story sets out to be this archetypal its success or failure is completely dependent on its execution. Fortunately Sword of Orion exceeds in this area. The production values are amazing, doubly impressive when you consider Briggs did the entire sound design himself. The cavernous derelict is bought to life so convincingly that you can virtually sense every shadowy corner of the wreck, drawing you in until you're sharing the apprehension of its explorers. From the early scenes set in an alien bazaar, through to the climactic scenes as an ion storm breaks around the ship, this is one of the easiest audio adventures for any listener to visualise. Briggs’s thundering, heavy music further emphasises both the overwhelming vacuum of space and the hulking behemoth of the ship itself. Sword of Orion is not perfect. It is, at times, quite hard to tell a few of the mercenaries apart, and episode one feels slightly padded out, but for a company in its infancy Big Finish delivered a remarkable adventure, and it is a perfect introduction into their world of Doctor Who audio adventures. If you like stories that are overflowing with atmosphere, then, to paraphrase a certain leader, Sword of Orion is "Excellent".